old volcano that was sacred to the Etruscans. 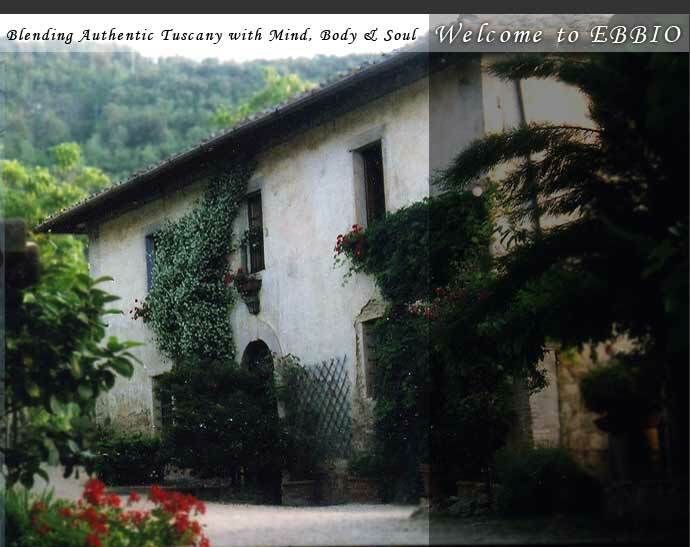 Ebbio is the ideal location to host a Italy Yoga Retreat for up to 25 people. Located in the breathtaking countryside of Tuscany, Italy, it is only 42 kms from Florence, 11 kms from Siena, 9 km from Castellina in Chianti and 1km from Monteriggioni, a little medieval jewel. In Ebbio, you will find the spectacular scenery blends well with the history that makes Tuscany such a unique vacation experience. Ebbio's rustic yet refined accommodations set itself apart from other Tuscan villas. An 800 year old classic Tuscany farmhouse converted into a stylish yoga retreat. The ambience of Ebbio is truly a one-of-a-kind experience. Looking out one of the many windows of the different accommodations in Ebbio, you will be captivated by the undulating hills swept with thriving vineyards, olive trees and enchanting evergreen forests. The amazing part of Ebbio is that it is still a working Tuscan Farm. An annual harvest of grapes are used to make authentic Chianti Wine that Tuscany is so well known for. Whether you are coming with a group, friends, family or on your own, we will arrange your perfect Tuscan vacation.